With the EU referendum just around the corner, I thought I would share some of the research we have carried out on the Grown in Britain WoodStock project on where the timber we use in the UK construction industry comes from. 38% of the sawn softwood consumed was home grown, with 92% of the imported softwood coming from the EU and 6% from Russia. 7% of the sawn hardwood consumed was home grown, with 55% of the imports coming from the EU, 21% from the USA, and 18% from tropical sources. 100% of the plywood was imported, with 42% of this coming from China, 19% from the EU and 16% from Brazil. 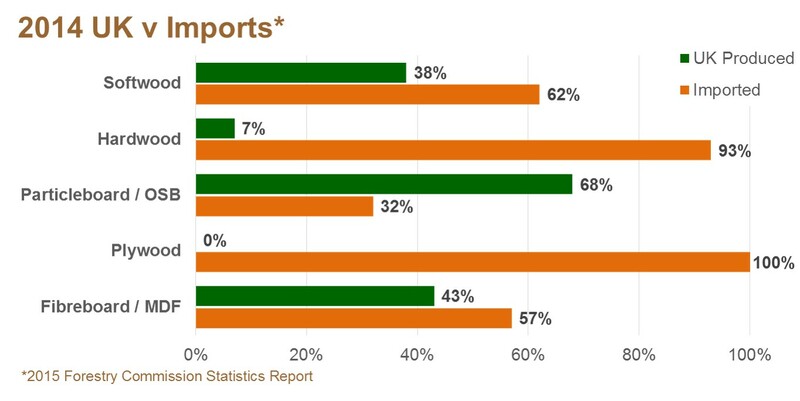 You will see from these figures that the UK is doing very well in the production of panel products (except for plywood). However it would be good to see more of a balance in the sawn softwood market, and with only 7% home grown, the sawn hardwood supply chain needs to be fixed, and this is something our Grown in Britain WoodStock Project is looking into. 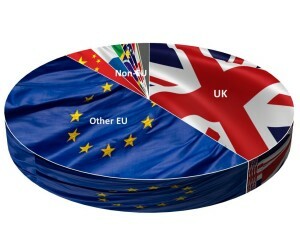 As for the EU picture you can see from the pie chart above that almost 90% of the sawn timber and panel product we consume is produced in the EU, with 40% of the total produced in the UK. How the EU referendum vote will affect this, no one really knows at the moment, but we do know that whatever happens, with only 13% forest cover currently in the UK, we will still need to import timber and panel products from somewhere in the short term, but we can look to increase our home grown resource in the long term. By asking for Grown in Britain licensed hardwood and softwood products you are creating demand, which will incentivise the planting of more woodland so we can get the UK nearer to the European average of 37% forest cover, and become more self-sufficient. For example the construction industry uses a lot of plywood for shuttering, hoardings, protection and within plasterboard walls, much of which you will see is imported from China. Lower grades of plywood (such as those used for protection and within plasterboard walls) could be substituted for OSB which uses home grown timber. Alternatively we can look to use higher quality plywood for hoardings and shuttering, say from Scandinavia, which can be reused a number of times, which is a more circular solution. In addition, by asking for Grown in Britain licensed hardwood, we can start to get some of the 64% of the UK’s unmanaged woodlands back into management and start producing quality saw logs again. The small amount of quality timber that is available in these woodlands will help finance replanting and proper management that will increase yields in the future. For example our research has shown that Ash could be produced at a competitive price, similar to that of imported Ash. If you would like us to help you with sustainable timber procurement, or help you obtain a Grown in Britain licence, please Contact Us.